One of The Wall Street Journal's Best Short Story Collections of 2018. Named a Summer Read by Vanity Fair, The Guardian, Nylon, Bustle and Literary Hub. One of Financial Times and TLS's Best Books of 2018. One of Granta’s Best Young American novelists, Catherine Lacey, the Whiting Award-winning author of The Answers, showcases her literary style in short fiction with Certain American States, a collection of stories about ordinary people seeking—and failing to find—the extraordinary in their lives. 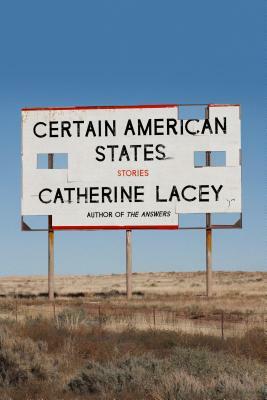 Catherine Lacey brings her narrative mastery to Certain American States, her first collection of short stories. As with her acclaimed novels Nobody Is Ever Missing and The Answers, she gives life to a group of subtly complex, instantly memorable characters whose searches for love, struggles with grief, and tentative journeys into the minutiae of the human condition are simultaneously gripping and devastating. The characters in Certain American States are continually coming to terms with their place in the world, and how to adapt to that place, before change inevitably returns. A woman leaves her dead husband’s clothing on the street, only for it to reappear on the body of a stranger; a man reads his ex-wife’s short story and neurotically contemplates whether it is about him; a young woman whose Texan mother insists on moving to New York City with her has her daily attempts to get over a family tragedy interrupted by a mute stranger showing her incoherent messages on his phone. These are stories of breakups, abandonment, and strained family ties; dead brothers and distant surrogate fathers; loneliness, happenstance, starting over, and learning to let go. Lacey’s elegiac and inspired prose is at its full power in this collection, further establishing her as one of the singular literary voices of her generation.